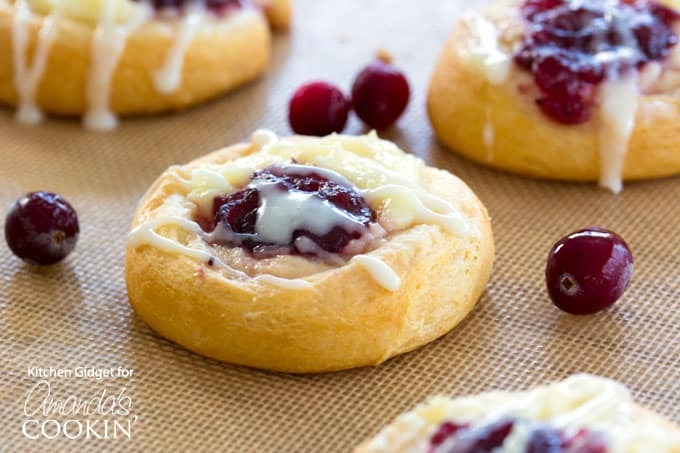 Start the day with some festive cheer with these cranberry cream cheese pastries! 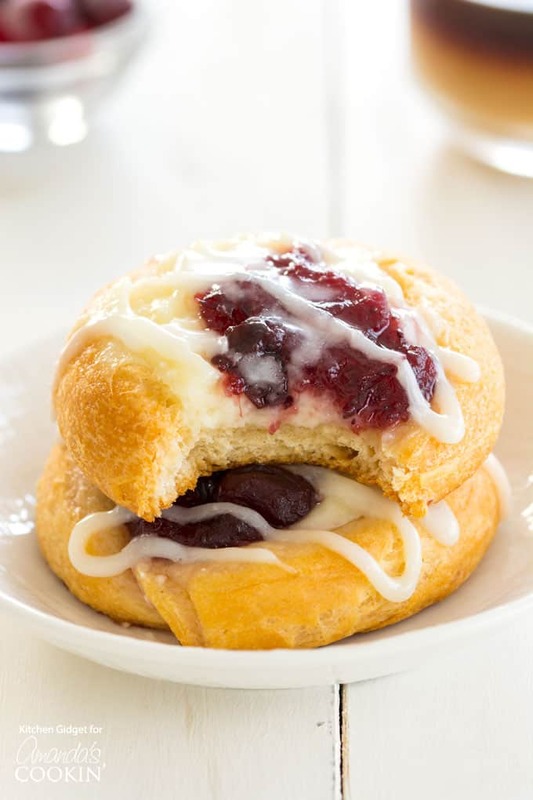 Crescent roll dough is filled with vanilla cream cheese, tart cranberry sauce and a drizzle of sweet icing. Switch up from the classic Homemade Cinnamon Rolls and make these sweet cranberry cream cheese pastries for breakfast! First, we enjoy a variety of traditional pastries from our Hispanic heritage like Quesitos (cheese filled pastries) with a cup of coffee or hot chocolate. Then the main dish always includes eggs like a breakfast casserole or Papas con Huevos (potato & egg tacos). This year, it’s cranberry cream cheese pastries on the menu and we can’t wait! I already made them for Thanksgiving and they were a huge hit. This recipe is for 1 tube of crescent roll dough or 8 pastries, but I highly recommend making a double batch since no one consumed less than two. I have to confess to eating 3 myself, they are just that good! For this recipe, you will need a tube of refrigerated crescent dough. I prefer to use the sheets of dough since they are uncut, but the rolls will also work. When you open the package, don’t unroll the dough. Leave it in a log and slice it into 8 rounds. You’ll need to create an indentation, sort of like a giant thumbprint cookie. 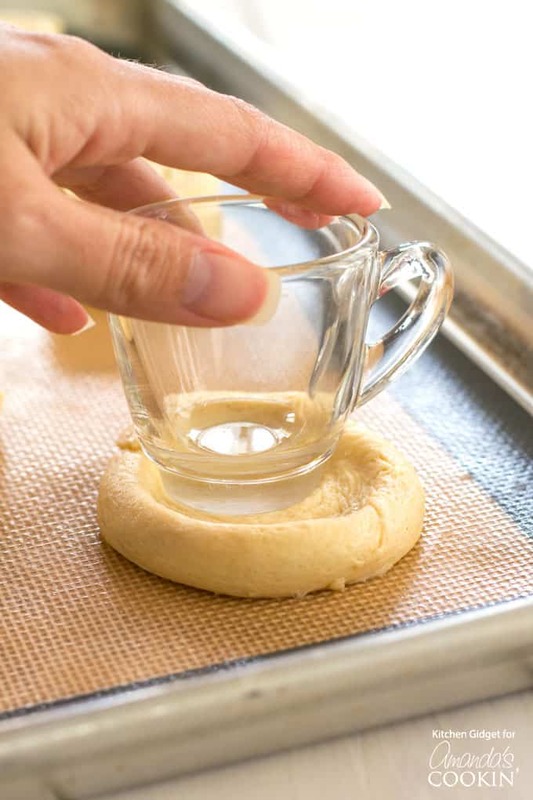 You can use the bottom of a cup, the back of a spoon or your fingers. Whatever works best for you! 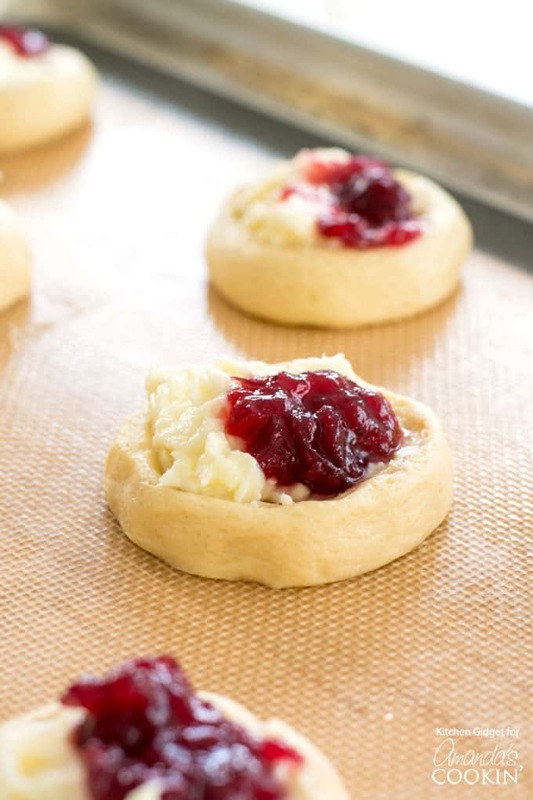 Once you have the dough shaped, fill it with the cream cheese mixture and cranberry sauce. 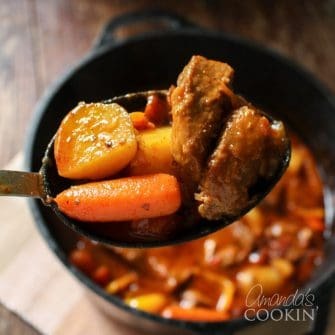 This is a great recipe to use up leftover sauce since you only need about a quarter cup. 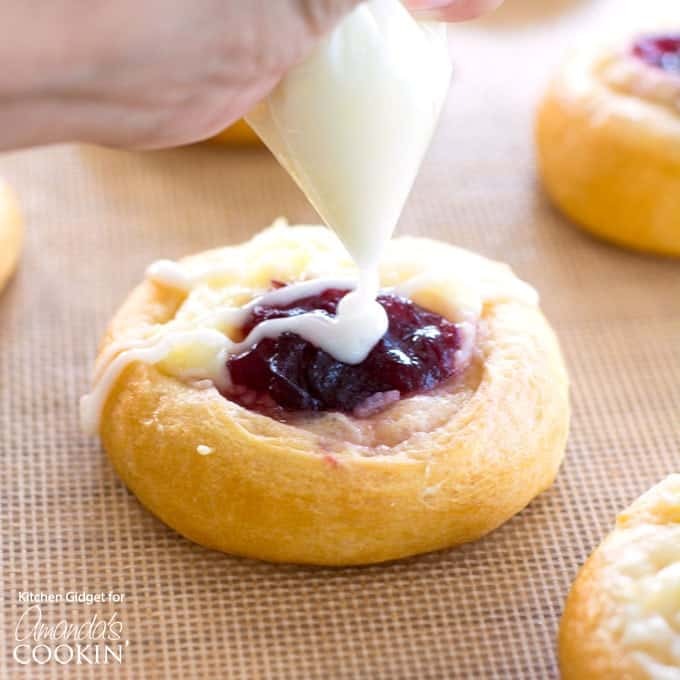 After baking, these cranberry cream cheese pastries get drizzled with a simple icing of milk and powdered sugar. If you want to kick it up a notch, substitute orange juice for the milk to make these pastries really pop with flavor! Want to give these even more of a twist? Try making them with this grapefruit marmalade! Breakfast with loved ones doesn’t get any sweeter! Just like this Banana Bread, Blueberry Breakfast Cake, and Quick Orange Rolls, these cranberry cream cheese pastries go perfectly with your morning cup of coffee or tea. A tasty breakfast is the key to starting your day right. These cranberry cream cheese pastries are simple to make and look very impressive! Fill each round with a tablespoon of the cream cheese mixture. Top with a heaping teaspoon of cranberry sauce. Bake at 350°F for 15-20 minutes or until golden brown. Let pastries cool 5 minutes.